My one hangup with my fabulous new carpool is the bike parking situation. I hoped for some kind of covered, secure place to lock my bicycle, perhaps a garage, easily accessible basement, or a covered porch at my coworker’s house. I rode the first morning, not knowing exactly what I would find (I already knew the garage option was out) but determined to make it work one way or another. I arrived early on day one and found no covered parking options. Instead, I locked up to one of the vertical support poles of a chain link fence in the back yard. Baby Jake and I were not pleased. Other than when actively being ridden, or for relatively short lock-ups when running errands, Baby Jake is an indoor bicycle. I didn’t like the idea of my lovely bicycle sitting exposed to the elements for ten-and-a-half hours every day, not to mention some concerns about theft. 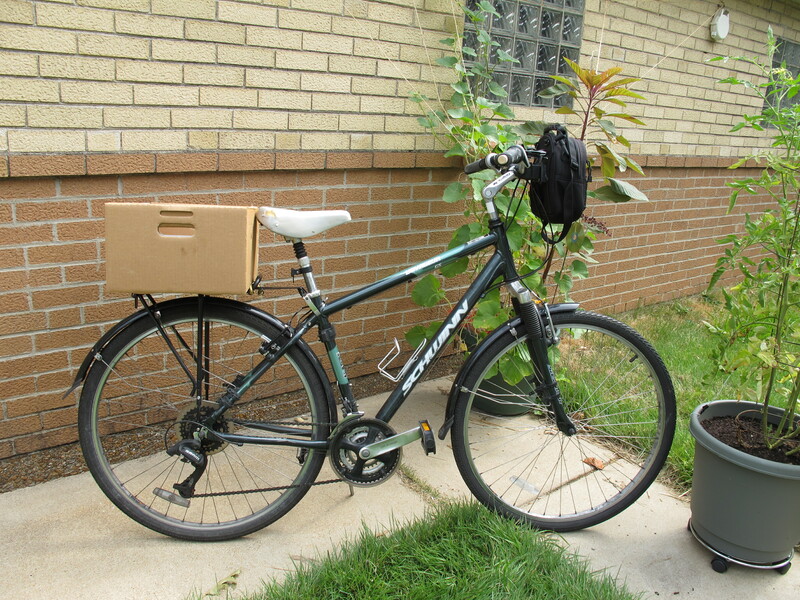 BUB lacked some of the convenient commuting accessories I’d added to my main bike, namely a rear rack and crate. I found a used rear rack at Bicycle Works, and planned to just switch my lone plastic milk crate back and forth between Baby Jake and BUB, but I tired of that pretty quickly. 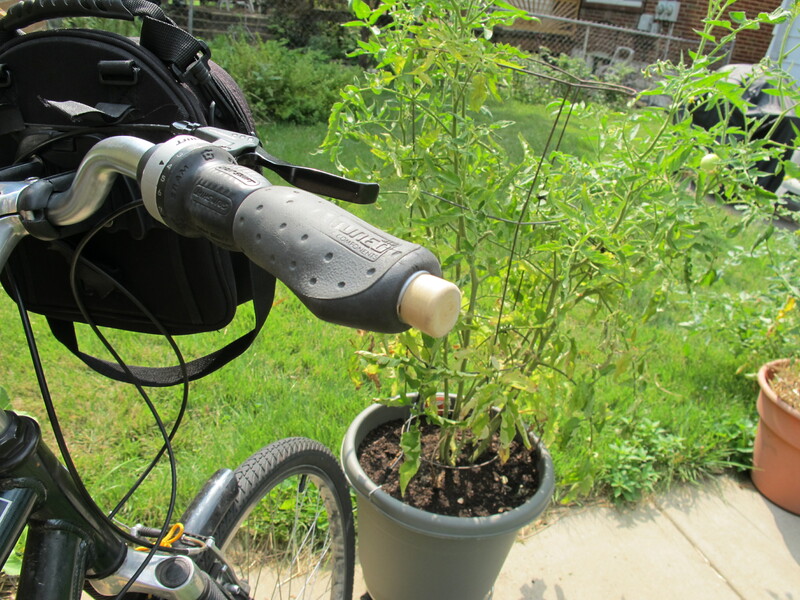 I toyed around with the notion of carrying a back pack, but it’s so nice to ride “naked,” i.e., no back pack, especially in the heat of summer. 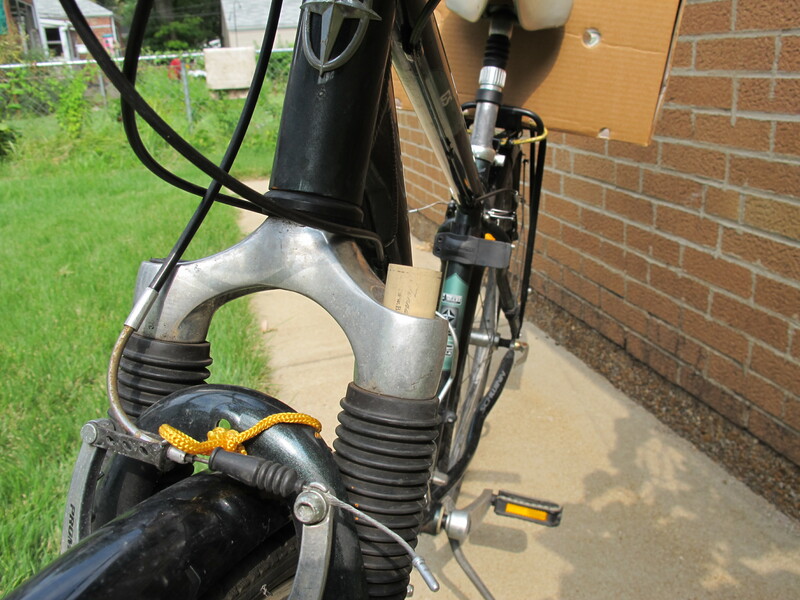 This entry was posted in Biking, Green Ideas, My Life and tagged bicycle commuting, bicycles. Bookmark the permalink. I love the aesthetic of the cardboard box. Very Japanese minimalist.